Located within a urban environment, it is a fine sand open beach of almost one kilometre long, very suitable for windsurfing and other water sports. The Baladrar cove is a lovely gate to the Mediterranean that stands out for the brightness typical on these latitudes, with pine trees leaning out towards the blue sea inviting the visitor to follow this pleasant aquatic route. This pebbly cove has formed at the mouth of the "dels Sesters" ravine. El Baladrar ends in a 30m. high cliff full of crannies formed by the action of the sea and from which the rock known as La Polida has fallen off. The cove is protected from the easterly winds, and its shallow and transparent waters and abundant sea life make it an ideal place to enjoy for a marine trip. Ideal swimming for the younger members of the family, protected by breakwaters and with gentle waves, this beach is the perfect spot for a family day out. 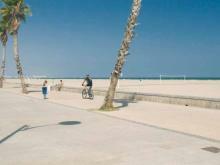 It also has the same services as the North beach, including access for the disabled. 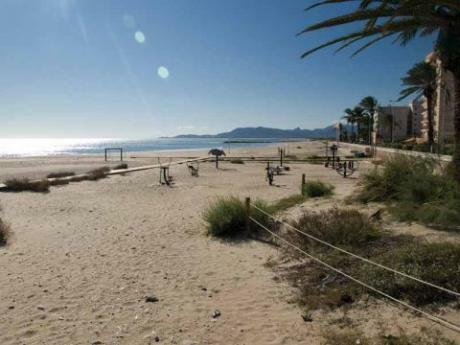 Playa Norte has been awarded the Spanish Quality Certificate "Q" for its excellent waters, clean golden sandy beaches and the quality of the wide range of services on offer. There are access points for the disabled, walkways, toilets, showers, lifeguards, beach police, ample parking and numerous restaurants and ice-cream parlours, everything you need for an excellent day on the beach. Urban and wide beach. Two long spikes shelter it from the sea strength and calm waters, this way being ideal for children. 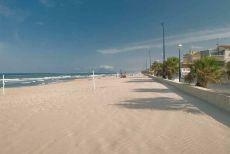 Its surface is composed of fine sand, with little slope and without unevenness. Boulders accumulate on its extremes. It is a very quiet beach also marking the southern limit of the Nature Reserve El Prat de Cabanes-Torreblanca. 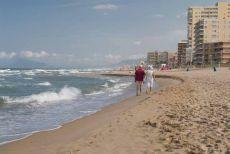 Located on the most southern side of the town, it is a very popular and wide beach of more then one kilometre long. Open and of fine sand, rides on horse back along it are very common images early in the morning and at dusk. Its waterfront is very frequented throughout the year, especially on weekends. It has an accessible area for people with reduced mobility. 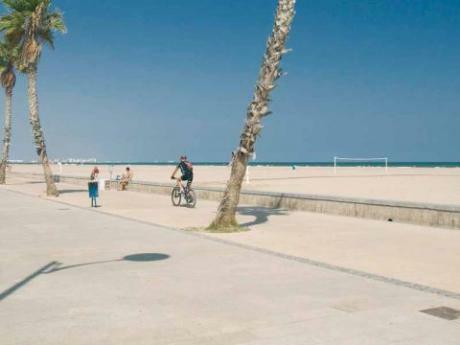 Urban beach of fine sand and clean waters, located within a urban environment consisting of small landscaped constructions. 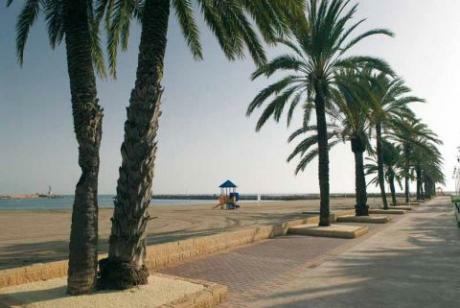 It is delimited by a well cared waterfront decorated with palms. 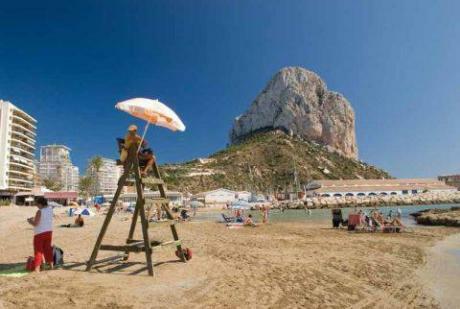 Beautiful views to Sierra del Montgó can be observed from this beach. 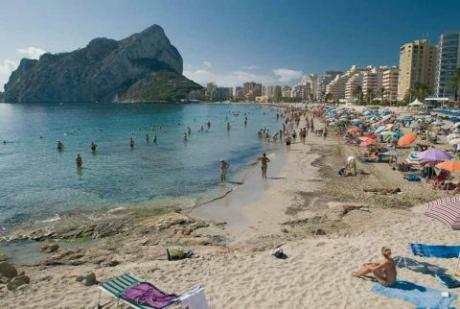 Between the Punta de Bassetes and the Peñón de Ifach a wide bay is formed where this beach is located, one of the most bustling beaches in Calpe. 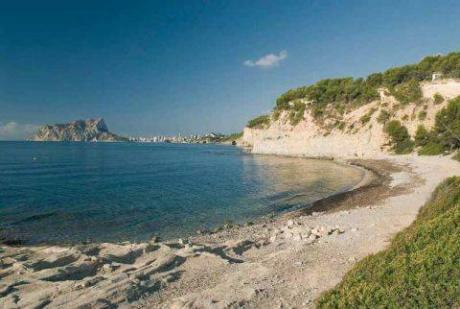 With fine golden sand, it has all kind of services and facilities and in summer nights it becomes an improvised cinema. It is delimited by a well cared waterfront where restaurants, ice-cream stalls and all kind of shops follow one another. Since 2004 it has the "Q" for tourist quality. Small creek with urban aspect and fine sand placed in the south of the fishing port. Very nearly are the Baños de la Reina, very valuable archaeological remains.